In addition to being tasked with solving the fire mystery, Elizabeth does her best to cope with the recent separation between her and her husband, and her unforgiving inability to have children. As the residents of Nelson County bind together to survive the fire and save their town, Elizabeth must do what she feels is right by everybody involved. It took me about three weeks to get through Smoke, and I'm still trying to pinpoint why I didn't love this novel as much as I loved McKenzie's others. 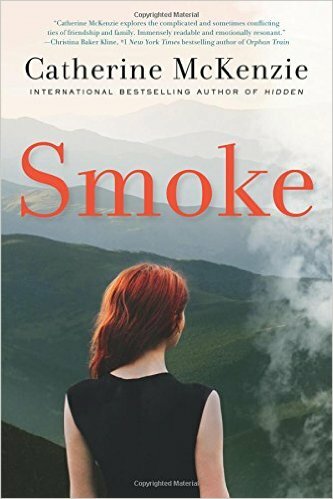 I'm impressed by the amount of research McKenzie did to write this novel, and I enjoyed the many wildfire facts and tidbits. Perhaps what made it drag on for me is that I was easily able to form an idea of exactly how the novel would end up playing out. I won't reveal any spoilers, but the foreshadowing (whether it was intentional or not), was highly evident, and maybe that's why I wasn't as eager to finish this novel. I already knew what was going to happen. Also, while I liked Elizabeth, I felt that her character was a bit too tame and mellow, especially compared to McKenzie's other star protagonists. While I had no problem relating to Elizabeth, she just wasn't as interesting as I wanted her to be. My favorite parts of Smoke were those in which Mindy made fun of her bubble-headed suburban girlfriends. I've spent many a weekend in various Rocky Mountain ski towns, so I'm only too familiar with those moms and women. Despite my neutral attitude about Smoke, I'm still a raging fan of Catherine McKenzie. I'm already looking forward to her next release!